What to do if a prospect comes to your landing page, starts to fill out the form, but doesn’t complete the task? Form abandonment and cart abandonment campaigns are standard practice for B2C and ecommerce marketers, less so for those of us B2B types who deal in leads vs. transactions. However, “recapture” techniques such as retargeting and email can play a role in B2B – and generate real ROI – if the volume of traffic to a particular landing page, and thus the number of people who abandon that form, merit the investment. Below is just such an email I received recently from Virgin America, the company that is now part of Alaska Airlines. It arrived in my inbox only minutes after I checked flight schedules for a trip to San Francisco, only to change my mind and book the flight elsewhere. As consumers, we’re all so used to being followed around the Web by retargeting ads that they’ve become almost invisible. But retargeting emails are less common, and for this consumer at least, Virgin’s email left an impression, if only because I loved its combination of brevity, relevance, and sense of humor. 1. Voice. As marketers we often pay lip service to notions of “tone” and “voice,” but let’s face it – many B2B campaigns (especially in the technology sector) tend to use the same, dry, corporate language. Virgin is a company that prides itself on standing out, on being irreverent, and here that personality comes through loud and clear. Even the pre-header copy (“We were just getting started”) is consistent with the overall tone, and the email is more effective for it. 2. Relevance. Virgin could have easily sent a standard “hey, looks like you didn’t complete your booking” email, but they didn’t. 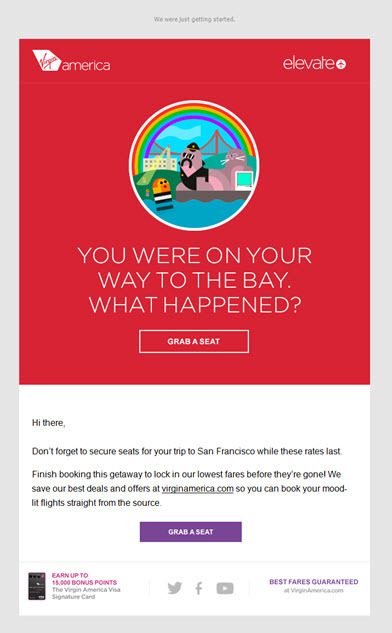 Instead, they used dynamic content (presumably) to personalize the email based on my intended destination. Moreover, that personalization is reflected not just in the headline, but even the header image. As a result, the email has more relevance, more immediacy. It feels like the company is talking to me, not just sending an automated email that could have gone to anyone. 3. Call to Action. Nothing ruins a good email campaign more quickly than a vague, ordinary CTA. Easily the most common offender is my personal favorite: “Learn More.” (Learn more about what? What happens when I click? What do I get?) Here, there’s no such confusion. The call to action (and button copy) is “Grab a seat” – clear, specific, and again: irreverent. The one thing I would have added? A sentence reminding me that Virgin has saved my planned itinerary for easy online retrieval – assuring me that, if I come back, I won’t have to start from Square One. This entry was posted in B2B Marketing, B2C Marketing, E-mail, email design, email marketing, Graphic Design, Interactive Design, Uncategorized and tagged B2B email, B2B email agency, b2b email best practices, B2B email marketing, B2B email tips, B2B lead nurturing, cart abandonment, form abandonment, Lead Nurturing, retargeting on December 15, 2016 by Howard Sewell.